In this medieval dark fantasy epic, Aleric the Falconer, torn from his beloved by war, falls prey to Pythia, the savage mistress whose embrace means death. 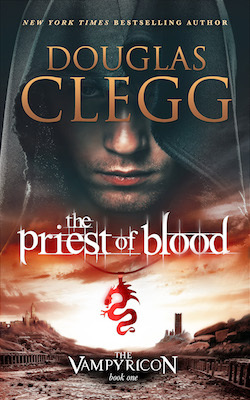 “If you like Game of Thrones and vampires, you’ll love The Vampyricon.”* Set in a world of ancient sorceries and buried cities, The Priest of Blood is the first book in The Vampyricon trilogy from NY Times bestselling author, Douglas Clegg. “Richly layered, beautifully rendered foray into a past filled with sorcery and mystery — and a rousing good story.” – Kelley Armstrong, New York Times bestselling author. “Stunning…gives the iconic vampire a massive makeover.”– Publishers Weekly, Starred Review. *”If you like Game of Thrones and vampires, you’ll love The Vampyricon.” – USA Today bestselling author Robert Swartwood.